The New 52 Superman and Lois have returned, which makes Jon happy until he realizes they aren't his parents. Superman demands to know what is going on but Mister Mxyzptlk doesn't give a straight answer. All Mxy wants to do is take Jon and leave but Jon refuses to go with him. As the world around them starts to fall apart Jon sees two glowing blue balls of light and recognizes them for what they are. Mxy leaves and with Jon's help the balls of light merge with Lois and Superman and put right what once went wrong. The timeline is reset and restored. In the end Superman, Lois and Jon return to their rightful home with Jon leading the way. Story - 5: This is an odd review to write because while it is the conclusion of the story it is also a massive change to Superman and his world. It forces me to look at it on both levels because both deserve that attention. Let's tackle the story first because, in all honesty, that's the easier one to discuss. Mxyzptlk continues to be that mix of funny and dangerous that has made him so entertaining through this storyline. I continue to almost feel bad for him and to be honest none of what happened could have happened without him so as much as he is the antagonist to this story he's also almost the hero. The hints to a larger threat is enticing and while I normally don't like one story to end only to lead into another the Superman creative teams have been doing their jobs so well that I can set that aside and roll with the punches. Jon was the heart of this issue and watching him deal with the fact that his parents might be gone was heartbreaking. Again, Jurgens (and Tomasi) did a great job of tugging at my emotions throughout this story so Jon feeling like he's lost his world played nicely against Superman feeling the same thing in the last chapter. It was neat seeing the New 52 Superman get to come out and play for a bit and while I liked seeing Lois it also felt like a bit of a cheat because in all honesty Lois wasn't a big part of the New 52. I hated that but this story seemed to make her more of a player than she was. Not that I'm complaining. Fixing Lois was one of my favorite parts of Rebirth. It was just a thought that crossed my mind as I was reading this issue. Which brings us to the second level of this story. The big one. The "This changes everything!" level. Thanks to several interviews I read online the biggest questions I had have been answered. The two Supermen have merged, the timeline has changed and this is how it is going to be for the foreseeable future. Knowing that saves me a lot of time because now I don't have to devote part of this review to asking those questions. So, what about the big picture? I mean this issue changes everything or at the very least it appears to change everything. I think it is fair to say that revealing Superman's identity to the world presented a host of problems that could not be easily fixed. To me it was a bad idea from the start but it also seemed to be incredibly short sighted. Revealing Superman's identity is like ripping out all of the cabinets and fixtures and appliances in your kitchen; you need a plan for what you're going to do next otherwise eating breakfast is going to be a problem. It's easy to tear something down and to remove a sacred cow but you better have a plan and I get the feeling that DC didn't have a plan beyond "We're getting rid of Clark Kent and depowering Superman!" Again, it's an interesting idea but what do you do after that? How do you fix that? The answer; take your time and use Mister Mxyzptlk. It's such an elegant way of getting back to the normal paradigm. By saying that somehow Superman was essentially split into two and now they are back together. I'm not entirely sure how that works but by coming back together it reset something in the timeline. I'm fairly sure this has to do with the Watchmen and its connection to Rebirth but this is the cosmic out Superman needed. It doesn't completely discount the New 52 Superman but it does bring Superman back to where he ultimately needs to be. This isn't just my personal opinion either. If you look at the various attempts to "fix" of "update" Superman over the past forty years it never takes. In 1971 Denny O'Neil wrote a storyline that took half of Superman's powers and turned all of the Kryptonite on Earth to iron while at the same time he and other writers changed Clark from a newspaper to a television reporter. The lowered powers and Kryptonite thing did not last all that long and eventually Clark was back behind the typewriter while still doing the evening news. John Byrne revamps Superman and takes away a lot of the trappings of the Silver and Bronze Age but once he was off the books a lot of those trapping started to creep their way back into the stories. It's almost like if you try to change Superman or at the very least try to mess with some of the aspects of Superman that all you're really doing is pulling on a rubber band. At some point, it is either going to snap or go back into place. By having Mxyzptlk serve as the catalyst for change you're giving Superman a cosmic out. Mxy has the power to change reality. Read the EMPEROR JOKER storyline and see what someone can do with a fraction of that power. I'm not suggesting that Mxy waved his hands and suddenly it was all back to the way it was before but having him involved gives the scenario plausibility. This whole thing also puts to rest the lie that Superman needs to be young and edgy to get people to read his books. If the sales figures are accurate SUPERMAN and ACTION are selling consistently well, usually within the top 50 out of the top 100 books. Jurgens and Tomasi have been delivering good stories week after week and it's about a Superman that is married with a kid. Maybe the world was ready for it. Maybe the world is tired of seeing a Superman just figuring it out. I'm not sure because I haven't done an official study but if I had to make an educated guess the lesson from all of this is that Superman is not the problem. The problem is cracking the code to telling good Superman stories and it looks like for the moment DC has managed to figure out that particular enigma machine. And I'm not even going to try and hide how excited this change makes me. I have been chomping at the bit for over a year for them to get back to having Clark and Lois at the Planet without having to lose Jon in the process. On a personal level I am very happy at this turn of events. Congratulations, Dan and Peter. You managed to deliver a major Superman storyline and you totally stuck the landing. Bravo. Art - 4: Some of the faces were a bit off in this issue but overall I like the art quite a bit. There were points where the story could have gotten lost but Mahnke and his inkers kept the ship going through choppy waters. It was neat to see Mahnke drawing the New 52 costume and while it was never a favorite I ended up sort of, kind of, maybe just a little bit liking it. The two-page spread of the Supermen coming together and history righting itself was fantastic. I especially liked S shield shaped panel in the center containing Superman's rogues gallery. In one image, everything that I like about Superman and his world was returned leading to another fantastic splash page showing off the revamped costume. This ended the issue on an epic note and made me hopeful for the future of these characters. 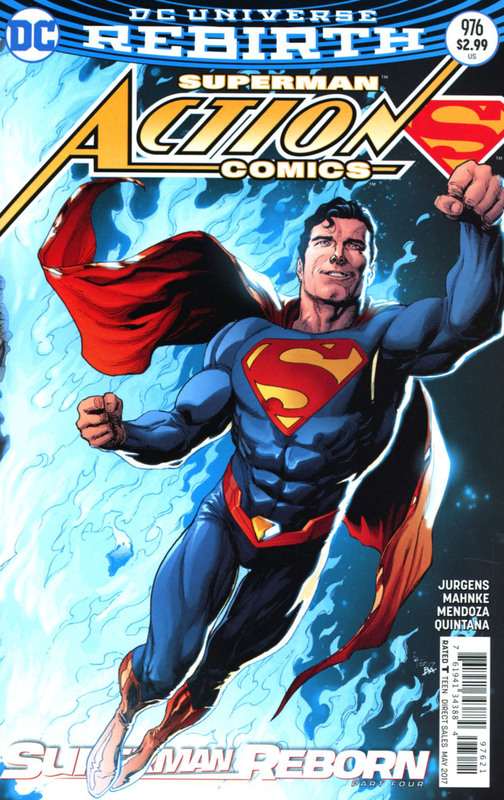 Cover Art - 5: The red and blue around the two Supermen led to some speculation that we might be seeing a return of Superman Red and Superman Blue. That didn't quite happen but this was a nice cover. 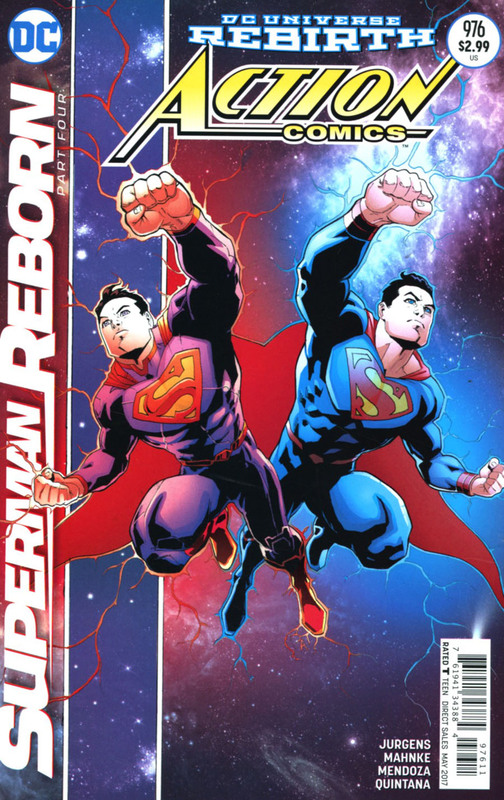 Both Supermen look fantastic and it fits nicely into the cover scheme they were going with for the two Superman books. Variant Cover Art - 5: On one hand this cover completely spoils the ending. On the other it is an epic shot of the reborn Superman. Frank manages to have small echoes of Christopher Reeve while not drawing a direct likeness, which I prefer.